What a joy to see the results of sowing seeds, seedlings, corms or bulbs in the soil. 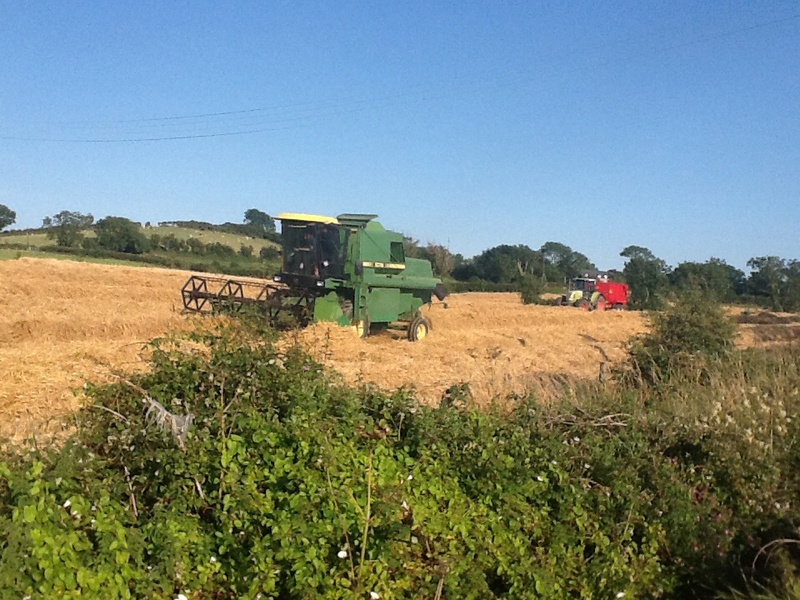 The farmer planted seeds of wheat nearly a year ago and he now harvested the golden crop that has grown up. My husband enjoys flowers. He planted one of my favourite flowers in early spring, Gladiolii. Green shoots have been growing all summer until now when we have a array of Beauty reaching up to the sky. I planted a courgette seedling. Look what it produced. My son went fishing last evening. Here is the harvest of his labour. We are eating the harvest of fish from the sea and plants from my garden. We delight in the richness of colour in our garden. « Pheasants Come to Visit. 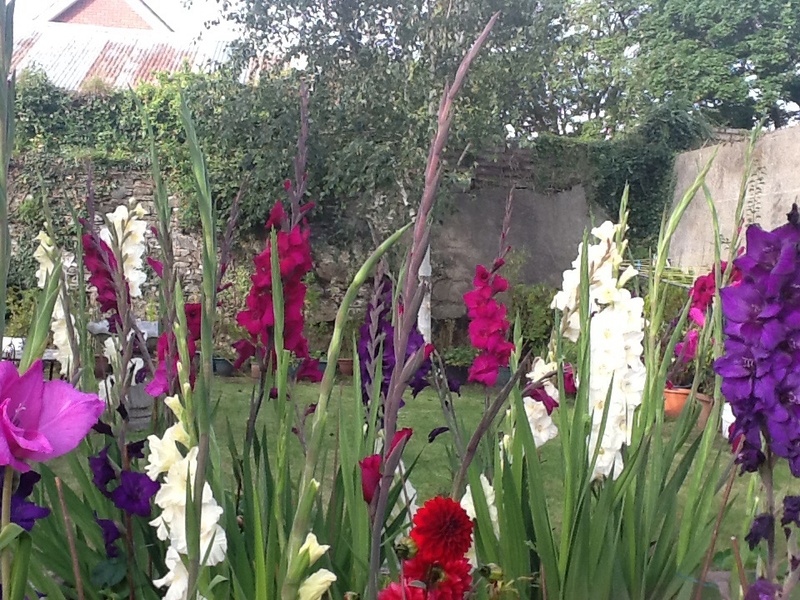 Your Gladioli look wonderfully colourful Angela & it’s lovely to see the Harvester Irish style. Only yesterday did I see a tractor that looked remotely like a European one. It had come from our host’s Dad’s farm in Minesota. Your courgettes are more flourishing than mine. 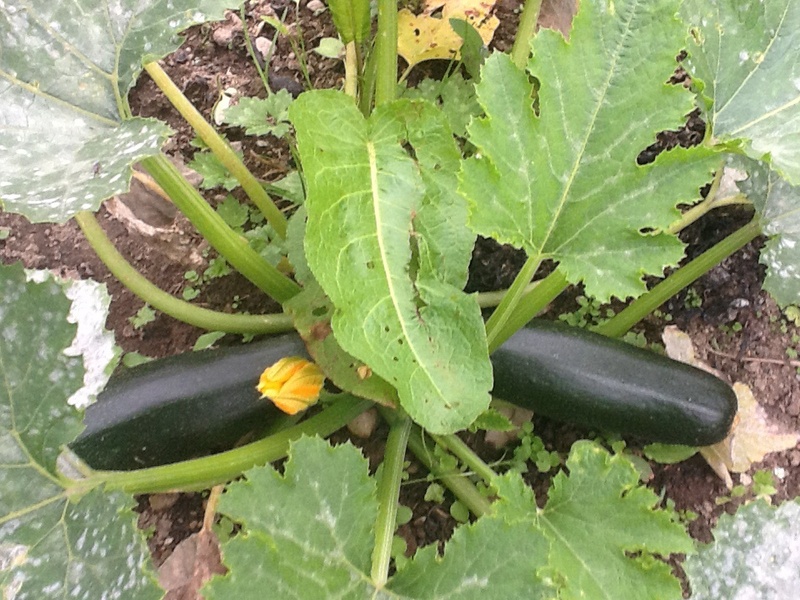 With no bees to be seen in these parts, the female courgette (zuchini)doesn’t get fertilized & this I learned this past week….it must be done by human intervention with a cotton bud. I’ve only had 3 or 4 courgette this summer & a squirrel or some such creature went off with one of these!! My few tomatoes are fully grown but not yet coloured..this I don’t understand, as they are sitting in the sun all day!!! Anyway, it’s such a pleasurably activity to be “pottering around” the garden/ “yard”. Whichever son went fishing (John? )…you forgot to upload the fish’s photo!! I’m sure that will be a hearty size. Thanks for posting the beauty of your surroundings. I always enjoy viewing them. And yes, I think, one “IS nearer to God in a garden than anywhere else on earth” as the rhyme goes.